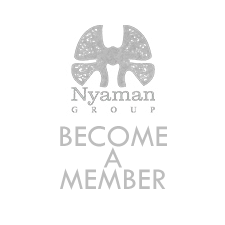 As an important actor of the high end tourism industry in Bali, Seminyak, Nyaman Group got mentioned several times in various articles claiming the quality of service, the beauty and comfort of our villas, the dedication to excellence and the friendliness of our staff. 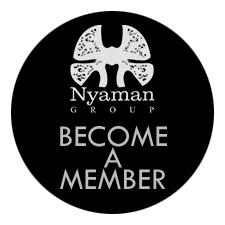 May it be the renowned Nyaman Villas or the Villas Chocolat, the amazing cruise in the Komodo National Parl aboard the Perjuangan, everybody agrees we know what we do! 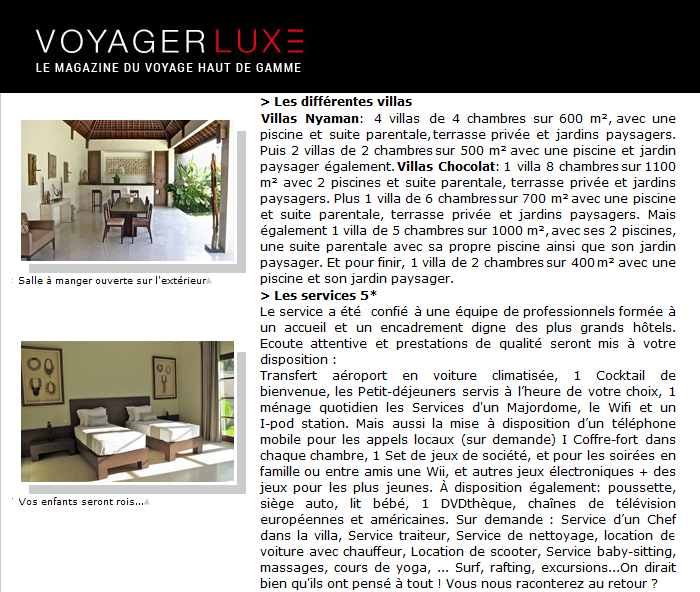 The Nyaman Villas and Villas Chocolat are nestled in the heart of a lush and fragrant landscaped garden. The omnipresence of noble and silky materials: leather, linen and velvet seem harmoniously married with exotic wood with silver highlights and soft, velvety tones, taupe, beige, mastic, honey and ivory, inviting the pleasure of the senses and serenity. Each living space is generously bathed in a light that is discreetly sieved at dusk, giving another dimension to the sacred representations and craft works of the archipelago which discreetly enriches the space. Bathrooms in and out. Heavy carved antique doors open onto open-air villas, each with a spacious living room overlooking the private garden where you can enjoy a traditional Balinese dinner or your breakfast. The fully equipped kitchen adds to the comfort of the villas. The light flooded rooms and master suites -25m² average- invite you to dream. Again the marriage of exotic essences and cushions in hues of honey and ivory… The lounge overlooks the private pool where you can cool off with a cocktail of exotic fruit between dives. Bathrooms finally have an outdoor shower and a beautiful terrazzo bathtub where you can see the plants run along the walls and waving in the breeze. Dining room open to the outside. Nyaman Villas: four 4-bedroom villas on 600 sqm each with a swimming pool and master suite, private terrace and landscaped gardens. Two 2-bedroom villas on 500 sqm each with a swimming pool and landscaped garden as well. 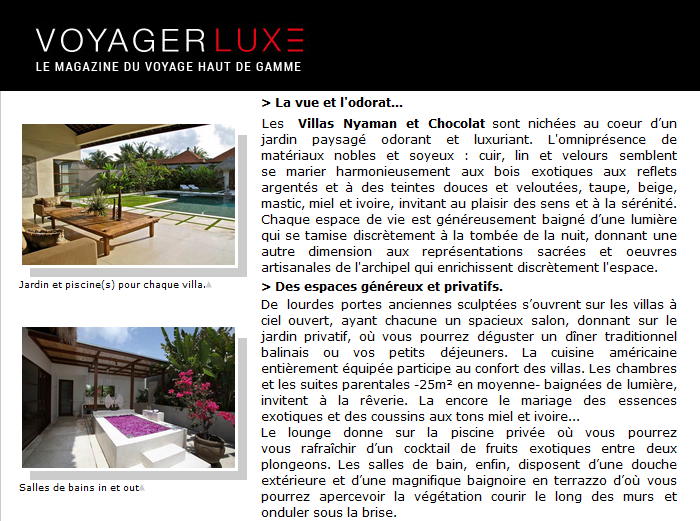 Villas Chocolat: one 8-bedroom villa on 1100 sqm with 2 pools and a master suite, private terrace and landscaped gardens. Plus one 6-bedroom villa on 700 sqm with a pool and a master suite, private terrace and landscaped gardens. Also a 5-bedroom villa on 1000 sqm, with 2 swimming pools, a master suite with its own swimming pool and landscaped garden. Finally, one 2-bedroom villa on 400 sqm with a swimming pool and landscaped garden. The service is entrusted to a team of professionals trained to a welcome and a management worthy of the largest hotels. Attentive listening and quality services are available to you: Airport transfer by air-conditioned car, a welcome cocktail, the breakfast served at the time of your choice, 1 daily cleaning, a butler’s services, Wi-Fi and an I-pod station. But also the provision of a mobile phone for local calls (on request) 1 safe in each bedroom, 1 set of board games, and for evenings with family or friends a Wii, and other electronic games + games for the younger ones. At disposal: stroller, car seat, baby bed, 1 DVD library, European and American television. On request: a service chef in the villa, catering service, cleaning service, car rental with driver, scooter rental, babysitting service, massage, yoga, Surf, rafting, trips… It looks like they thought of everything! You’ll tell us when you get back? 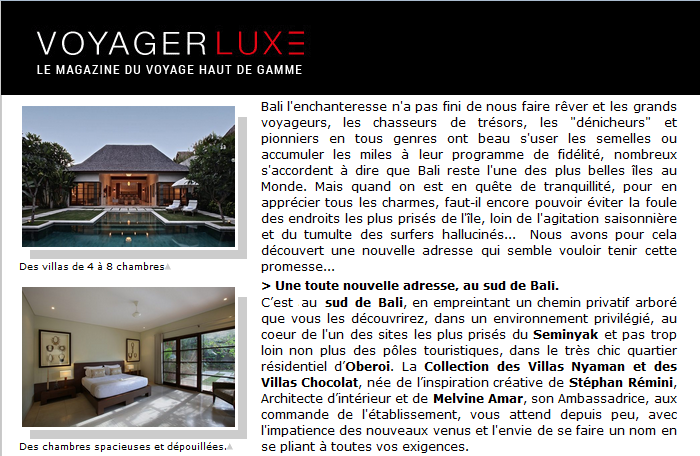 This is the wish of the french interior designer, creator of the Nyaman Villas concept in Bali. South of the blessed island, in the small town of Seminyak, French architect and French designer welcome you to the shelter of a set of 6 villas with exclusive services. Large structures open on vegetation, spaces that French architect wanted bright and uncluttered that decline a minimalist style, punctuated with ethnic artwork. The noble materials, leather, linen and exotic woods, are in gentle harmony with the shades of ivory, putty, taupe and gray, and create an atmosphere of Zen. Through private gardens, open bathrooms and common areas the Balinese spirit is omnipresent. An intimate and quiet place, reserved for travelers in search of refinement, wishing to explore Bali at their own pace.